A report from the British Meteorological Office has forecast a hot summer for the southern hemisphere as a strong El Nino, fuelled by climate change, takes hold. MAN-MADE GLOBAL warming is set to produce exceptionally high average temperatures this year and next, boosted by natural weather phenomena such as El Nino, Britain’s top climate and weather body said in a report on Monday. “It looks very likely that globally 2014, 2015 and 2016 will all be amongst the very warmest years ever recorded,” Rowan Sutton of the National Centre for Atmospheric Science said. This “pause” has been seized upon by sceptics as evidence that climate change was driven more by natural cycles than human activity. The 20-page report from Britain’s Met Office, entitled “Big changes underway in the climate system?”, highlights current transitions in major weather patterns that affect rainfall and temperatures at a regional level. An El Nino weather pattern centred in the tropical Pacific Ocean is “well underway”, the report says, and shaping up to be one of the most intense on record. 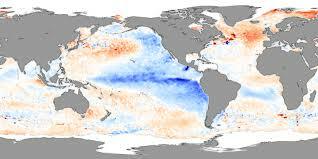 Very strong El Ninos also occurred over the winters of 1997 and 1982. Set to grow stronger in the coming months, the current El Nino — a result of shifting winds and ocean circulation — is likely to result is dry conditions in parts of Asia and Australia, as well as southern and sub-Saharan North Africa, the Met Office said. By contrast, the southwestern United States — including parched California, suffering from an historic drought — has a strong chance of seeing higher-than-average rainfall. Finally, the interplay of ocean currents and atmosphere in the Atlantic — another multi-decade oscillation — is moving the other way, and will have a cooling effect. “The current warm phase is now 20 years long and historical precedent suggests a return to relatively cool conditions could occur within a few years,” the report says. “We know that natural patterns contribute to global temperature in any given year, but very warm temperatures so far this year indicate the continued impact of increasing greenhouse gases,” said Stephen Belcher, director of the Met Office Hadley Centre.